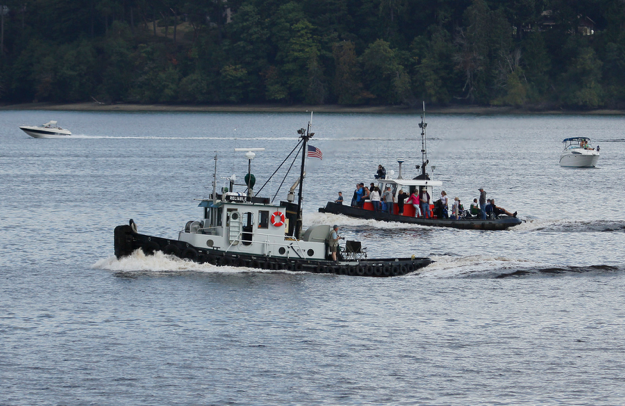 Tug of the Month: Reliable — Olympia Harbor Days | 3-Day Festival Featuring the World's Largest Vintage Tugboat Races! RELIABLE was built in 1945 as ST (Small Tug) 908 for the US Army. Burger Boat of Manitowoc, Wisconsin was the builder. The Army Transportation Corps during World War II customarily shipped small tugs aboard larger transport ships for harbor duties in remote bases. From 1945 to 1956, ST 908 she was stationed in ports as disparate as those in England and Texas. Her initial engine was a Buda 6 cylinder, 170 horsepower (HP) diesel. In 1956, she was decommissioned and mothballed in San Diego. In 1960, her Buda diesel was replaced by a Gray Marine 671, generating 185 HP. Her length is 45 feet, her beam is 12 feet, six inches, and she draws six feet. History Mystery: In Gordon Newell and Joe Williamson’s Pacific Tugboats (See “Sources” below), on page 75, two photos of an earlier “Reliable” appear as an example of conversion from a passenger steamer to a river tugboat. No date nor location are given. These photos may be from Williamson’s photo collection at Puget Sound Maritime Historical Society. Williamson was their first president. SSMHA will follow up on the mystery. In 1961, The Scripts Institute of Oceanography acquired RELIABLE through the State Educational Agency for Surplus Property. .In 1973, she was loaned to Moss Landing marine Laboratory and named Artemia. She was fitted with various electronics and carried students on research projects out of San Diego during the ensuing 15 years. In 1976, Artemia (RELIABLE) was sold to William H. Richter of San Diego and renamed Dolphin. Richter modified her for gillnetting and long line fishing. He installed a net reel, stabilizers, deck winches, and a refrigerated hold. The deckhouse was extended by two feet aft, and an internal galley access was added. The hull was painted blue, and the deckhouse, orange. 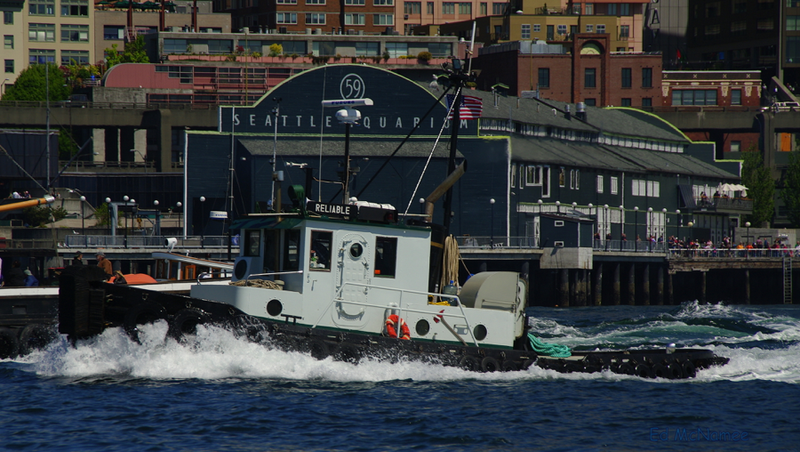 In 1984, she was sold to Phil Shively, veteran Puget Sound tug owner, who named her RELIABLE. Shively removed the fishing gear and restored her to a proper tugboat configuration. She towed commercially for the next 20 years. During the Shively ownership, RELIABLE often attended Olympia Harbor Days (OHD) races, including the years 2001 and 2002. In 2003, RELIABLE was sold to Paul Skeffington, and towed barges, floating docks, and yachts until 2006, when he sold her to Cliff Center. Cliff gave her a major overhaul, which included a reconstructed fantail, new rudder configuration, a bow thruster, anchor winch, a remodeled wheelhouse, new fenders and generator, and new accommodations, head, shower and galley. Under Cliff’s ownership, RELIABLE worked for the US Navy at Bangor, Bremerton, Naval Base Everett and Indian Island, towing port security barriers between bases and to Port Gamble for haul-out and maintenance. Cliff and Wanda Center took her on vacation visits to the San Juan Islands and Canada. During this period, she was a frequent participant in the Puget Sound maritime celebrations including four OHD races and three Seattle tug race events. Cliff found that many OHD spectators remembered the tug’s previous OHD appearances when Phil Shively was owner. She was named Logo Tug for the 2014 races. In 2018, an “onslaught” of Coast Guard subchapter M regulations convinced Cliff that the days of small owner-operated tugs were ending. He sold RELIABLE to Ian Blaney of Victoria and Genoa Bay, B.C., who intends to teach his grandson seamanship aboard the tug. We at OHD hope that Ian attends Harbor Days in the future, and, if not racing, displays this beautiful small tug to OHD visitors. Sources: Interview with Cliff Center, Pacific Tugboats by Gordon Newell and Joe Williamson, Superior Publishing, 1957, Tugboats on Puget Sound by Chuck Fowler and Capt. Mark Freeman, Arcadia Publishing, 2009, Ships of the Inland Sea by Gordon Newell, Binsfort and Mort Publishers, 1960. About Les Eldridge: Les is president of the South Sound Maritime Heritage Association and author of a number of maritime histories, a series of novels on the American Civil War at sea, and a book of humorous verse. He lectures frequently ashore and afloat, and narrates the OHD races each year. In 1989, as a Washington State Centennial Commissioner, he chaired the Commission’s Maritime Committee. For more, see EldridgeSeaSaga.com. Tug of the Month is sponsored by Olympia Harbor Days Tug Boat Races and Festival, an Olympia Kiwanis Club event free to the community. It takes place every Labor Day weekend on the Olympia waterfront. It is in its 45th year. For attendance information, see www.HarborDays.com, or on Facebook @ OlympiaHarborDays. Questions to Executive Director Carol Riley at info@harbordays.com.